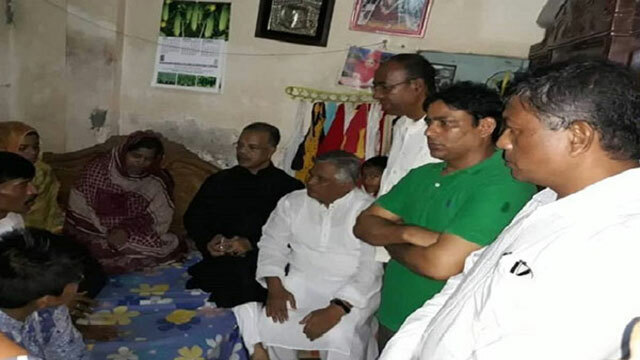 Dhaka, Aug 2 (Just News): A BNP delegation visited the houses of Diya Khanam Mim and Abdul Karim Rajib, who died in a road crash in the city, on Wednesday and consoled their bereaved family members. The five-member BNP team, led by Amanullah Aman, first went to Mim's Mohakhali house around 7pm and talked to her parents and other family members, said BNP chairperson's media wing member Shamsuddin Didar. Later, they went to Rajib's house at Ashkona around 8:30pm. The four other BNP leaders are Fazlul Haque Milon, Nazimuddin Alam, Anisur Rahman Talukder Khokon and Shamsuzzaman Suruj. Contacted, Milon said they visited the houses of Mim and Rajib directed by their party acting chairman Tarique Rahman and conveyed their party's sympathy to the bereaved family members. He said they also assured the two families of standing beside them in ensuring justice. On Sunday, Mim and Rajib, students of the college section of Shaheed Ramiz Uddin School and College, were killed as a 'Jabal-e-Noor Paribahan' bus ploughed through some students in front of Kurmitola General Hospital on Airport Road, triggering a widespread protest that caused immense public sufferings.